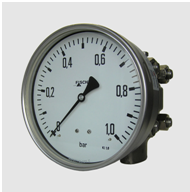 Absolute pressure guage is used for monitoring gaseous and liquid media. The unit is in particular characterized by the fact that it is available in optionally stainless steel or HASTELLOY® and therefore qualifies for diverse and aggressive media. As an option, the pressure gauge can also be equipped with limit signal switches as auxiliary electric components. Measuring ranges from 0..25 mbar abs to 0..6 bar abs serve to cover a wide measuring range. process flows in the process industry. Next Next post: Fire & Smoke Detection with MSR Germany Sensor.